MLB Free Agency is in full swing! That means it’s time for lots of hot stove talk and predictions of where each of the top MLB free agents will land this winter. It is one of my favorite articles of the year as I love doing predictions. 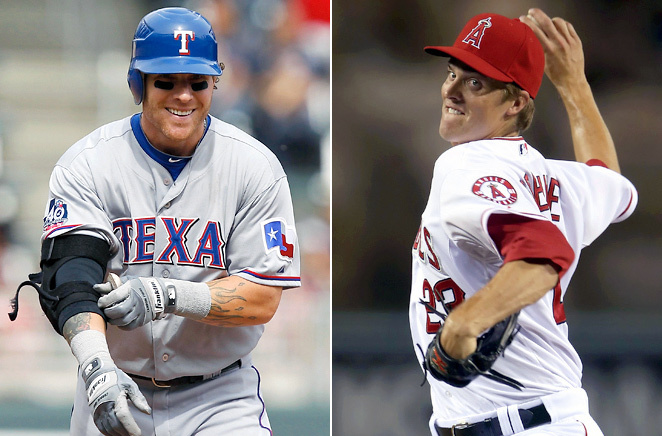 The top free agents this year are Zack Greinke, Josh Hamilton, Michael Bourn, B.J. Upton, Anibal Sanchez, Dan Haren, Kyle Lohse, Nick Swisher, Edwin Jackson, and Mike Napoli, to name a few. So why don’t we just get to it? Here are my free agent landing spot predictions for the top free agents this off-season. Enjoy. 1.Zack Greinke: Los Angeles Angels, 6 years, $129 million – The Angels can ill afford to lose Greinke after seeing how great he pitched after they acquired him in July and showed how well he handled pitching in a big market. They need a reliable number two starter behind Jered Weaver and have to throw C.J. Wilson into the number three starters roll. After declining Dan Haren’s 2013 option and trading Ervin Santana, the Angels NEED to bring Grienke back. Other teams I expect to be in the hunt: Los Angeles Dodgers, Seattle Mariners, Texas Rangers, Milwaukee Brewers, Chicago Cubs, Atlanta Braves, Boston Redsox, Toronto Blue Jays, Baltimore Orioles, Chicago Whitesox. 2.Josh Hamilton: Baltimore Orioles, 5 years, $105 million – Word is, is that the Rangers are only willing to go as long as three years with Hamilton which could cause Hamilton to leave if he gets better offers. I’m sure teams like Baltimore and Seattle, who are looking to make a big splash, would love to get their hands on this superstar. The rumor is, is that Hamilton wants seven years and $175 million, but I highly doubt he even comes close to that. I think the longest contract he gets is only five years, maybe, just maybe someone offers a sixth year, but I don’t see him getting over $150 million. I think with so many teams weary of giving Hamilton a gigantic contract and his injury history and his eyes issue, that not many people will even chase him. This opens the door for the Orioles. The Orioles get the big slugger they want and need! After whiffing on Mark Teixeira before the 2009 season, the Orioles get big time superstar outfielder Josh Hamilton for less years and money, and happen to be a playoff team without him. Are they a World Series team WITH Hamilton? It’s possible, but I don’t know. Having Hamilton, Adam Jones, Nick Markakis, J.J. Hardy, Chris Davis, Matt Weiters, and Manny Machado in your everyday lineup is very impressive. They just gotta hope he doesn’t break down or go on a bender during his time in Baltimore. I hope he doesn’t. Now the Orioles just gotta figure out their pitching. Other teams I expect to be in the hunt: Seattle Mariners, Detroit Tigers, Texans Rangers, Philadelphia Phillies, Milwaukee Brewers, San Francisco Giants. 3.B.J. Upton: Philadelphia Phillies, 6 years, $106 million – The Phillies need outfielders and some more power and speed, and that’s exactly what Upton brings. A lot of people will be in line for Upton as he brings a 20+ homer bat, 30+ steals, and good defense to the table, which is hard to find if any outfielder, let alone a center fielder. After trading Shane Victorino in July to the Dodgers, the Phillies need a replacement and Upton would be perfect in Philly. The Phillies need to make a somewhat big splash this off-season and getting Upton would be perfect in their ball park. The only question is, is how much will Upton get? Will he get a big enough deal that is out of Philadelphia’s range? It’s not a distinct possibility. Other teams I expect to be in the hunt: Washington Nationals, Atlanta Braves, Chicago Cubs, Cincinnati Reds, San Francisco Giants, New York Yankees, Boston Redsox, Seattle Mariners. 4.Michael Bourn: Washington Nationals, 5 years, $88 million – The Nationals need a speedster, lead off hitter, and a good defender in center field. Well, that’s what Bourn is all of that. The question is, is how much will Bourn get? Some baseball execs think a team or two will overbid for Bourn’s services. Well, would the Nationals be that team? I’m not sure after they payed $126 million for Jayson Werth in the off-season of 2010-2011. Plus, don’t forget that the Nationals have to re-sign first baseman Adam LaRoche as well and word is, is that the Nats want LaRoche back after having a career year in D.C. Getting a guy like Bourn would really help this lineup and make them all the more serious as a World Series contender. Other teams I expect to be in the hunt: Atlanta Braves, Philadelphia Phillies, Cincinnati Reds, San Francisco Giants, Boston Redsox. 5.Anibal Sanchez: Los Angeles Dodgers, 5 years, $79 million – The Dodgers have some pitching with Clayton Kershaw, Josh Beckett, Chris Capuano, Ted Lilly, Aaron Harang, and Chad Billingsley, but some people believe one of them will be traded and you can never have enough pitching. Kershaw, Sanchez, and Beckett would be a pretty solid 1-2-3 in the rotation and a solid rotation for a playoff series. Jon Morosi of FOXSPORTS.com reports that his sources tell him that Sanchez is looking for a six-year, $90 million deal, and the Dodgers are definitely a team that can afford that. Josh Beckett isn’t a reliable number two anymore, whereas Sanchez is, so there’s a great fit here. The Detroit Tigers will try their hardest to try to re-sign Sanchez, so it won’t be easy for the Dodgers, but I think the Dodgers win out because they need the pitching and are hungry to get back to the postseason. Other teams I expect to be in the hunt: Detroit Tigers, Los Angeles Angels, Texas Rangers, Seattle Mariners, Boston Redsox, Baltimore Orioles, Toronto Blue Jays, Chicago Cubs. 6.Kyle Lohse: Detroit Tigers, 3 years, $42 million- Losing out on re-signing Anibal Sanchez, the Tigers will shift their attention to the next best pitcher and the cheaper alternative, Kyle Lohse, who has been very good the last two years with a 3.39 era in 2011 and a 2.86 era in 2012. Going to the AL will be a challenge, but I don’t view many NL teams chasing him hard as the Cardinals can’t afford him, and the Dodgers will be getting Sanchez. The Braves, Phillies, and Nationals have pitching, and I don’t see the Cubs, Brewers, or Reds going for him because of his age (he’s 34). I think the Tigers need a solid starter to replace Sanchez’s productivity and Lohse is the guy. He won’t overpower a guy with a strong fastball and a lot of strikeouts, but he’ll always keep a team in games. He’ll probably get a two or three-year deal, and the Tigers are in win now mode, so I’d like this signing for them. Other teams I expect to be in the hunt: St.Louis Cardinals, Milwaukee Brewers, Boston Redsox, New York Yankees, Baltimore Orioles, Toronto Blue Jays, Chicago Whitesox, Cleveland Indians, Kansas City Royals, Texas Rangers, Seattle Mariners. 7.Nick Swisher: Seattle Mariners, 5 years, $90 million – The Mariners are moving the fences in this winter at Safeco Field and I believe they’re going to overpay for a free agent hitter and/or pitcher this off-season and I think they nab Swisher on an overpay. The Mariners need hitters badly as the only consistent one they have is young rising star catcher Jesus Montero, who was acquired in a trade with the Yankees last winter for pitcher Michael Pineda. Getting Swisher, who is a good OBP guy, who also hits 20+ homers would really help the M’s lineup and maybe attract other big names to Seattle. Seattle needs hope, that’s all I know with a really tough AL West division. Other teams I expect to be in the hunt: Boston Redsox, Baltimore Orioles, Texas Rangers, Houston Astros, Atlanta Braves, San Francisco Giants. 8.Kiroki Kuroda: New York Yankees, 1 year, $14 million – The Yankees NEED to bring back Kuroda as the pitching behind C.C. Sabathia next year isn’t too pretty. No one knows what you’re getting out of Michael Pineda next season after shoulder surgery, no one knows if Andy Pettitte is returning yet, and Phil Hughes is just way too inconsistent to be comfortable going into the season next year with him as the Yankees number three, or possibly even number two starter. Is there much else to say? After a very good year in pinstripes in 2012, I think the Yanks give Kuroda another one year deal with a raise in his salary, which obviously will be expected. Other teams I expect to be interested: Boston Redsox, Baltimore Orioles, Los Angeles Dodgers. 9.Dan Haren: Boston Redsox, 1 year, $10 million – The Redsox were supposedly involved in trade talks with the Los Angeles Angels last week to acquire Haren before there was a deal in place with the Chicago Cubs, but then that deal fell through. The Angels ended up declining Haren’s 2013 option and allowing him to be a free agent. He has injury concerns with his back which made him miss a handful of starts this past season, but when he’s healthy, he is a very good pitcher and I’m sure a lot of teams will check him out as long as his medical exams come up clean. The Redsox need another pitcher to fill out their rotation and having a veteran workhorse like Haren would bring leadership, depth, and a positive attitude to the Redsox clubhouse that needs it. I think this is a good match for both as the Redsox look to get back on winning track. Other teams I expect to be interested: Baltimore Orioles, Cleveland Indians, Seattle Mariners, Los Angeles Angels, Philadelphia Phillies, Chicago Cubs, Milwaukee Brewers, Pittsburgh Pirates, Arizona Diamondbacks, Los Angeles Dodgers, San Diego Padres, Colorado Rockies. 10.Edwin Jackson: Toronto Blue Jays, 3 years, $40 million – The Jays will be aggressive this off-season for starting pitching help and they really like Edwin Jackson and evaluated him last off-season when he was a free agent and before he signed a one year deal with the Washington Nationals. He had a solid year in D.C. and should be able to get a multi-year deal this winter and with how bad the Jays pitched last season, I think they make a big push for Jackson, who is an innings eater, and strikes out 140+ batters a year and can really bolster the middle of that Toronto rotation. A bevy of teams will be in the hunt though, so the Blue Jays may have to overpay a bit to get Jackson. Other teams I expect to be interested: New York Yankees, Boston Redsox, Minnesota Twins, Seattle Mariners, Washington Nationals, Chicago Cubs, Pittsburgh Pirates, Los Angeles Dodgers, San Diego Padres, Colorado Rockies. 11.Rafael Soriano: Detroit Tigers, 3 years, $45 million- The Tigers get rid of Jose Valverde this winter and have a chance to get a way better closer who causes way fewer headaches and is more reliable in Rafael Soriano. Soriano is looking for a big payday after saving 42 games in 46 chances for the New York Yankees after Mariano Rivera went down with a torn ACL in May. The Tigers have a solid bullpen with Phil Coke, Octavio Dotel, Joaquin Benoit, and Al Albuquerque, but have no guy who is a shut down closer. They could have a competition in spring training, but I think they’d prefer to have a set closer and have the rest of those guys pitch in their normal spots and have a strong bullpen. The Tigers owner has a good relationship with Scott Boras, the agent for Soriano, so I think a deal can get done. The Tigers made the World Series this year and they signed Prince Fielder last winter, so they are a big money team now. Other teams I expect to be interested: New York Yankees, Boston Redsox, Toronto Blue Jays, Los Angeles Angels, Texas Rangers. 12.Angel Pagan: San Francisco Giants, 3 years, $40 million – Angel Pagan had a career year at AT&T Park and is ready to cash in, in free agency. The Giants like him and want him back. With Melky Cabrera not coming back, the Giants would be in big trouble if they let Pagan go too. They’ll try everything they can to keep Pagan and Pagan likes San Francisco but wants his big payday and I think the Giants give him it. Pagan was a big reason why the Giants were the World Series champs this season and the Giants need him back with his defense, speed, and switch hitting ability. Other teams I expect to be interested: Kansas City Royals, Texas Rangers, Seattle Mariners, Philadelphia Phillies, Atlanta Braves, Washington Nationals, Cincinnati Reds. 13.Adam LaRoche: Washington Nationals, 3 years, $48 million – Adam LaRoche had a career year for the Nats in 2012 and the Nats want him back manning first base for them. LaRoche rejected the $13.3 million qualifying offer, so he expects to get more on what could be his final big payday. The Nats could use his left-handed bat back and should spend now that they are in win now mode. Bring back LaRoche and adding Bourn would really solidify this team as one of the scarier teams to play. Open up your wallets, Washington! Other teams I expect to be interested: Boston Redsox, Tampa Bay Rays, Texas Rangers, Milwaukee Brewers. 14.Mike Napoli: New York Yankees, 2 years, $21 million – I think the Yankees are done with Russell Martin after he had a disappointing 2012 outside of his power numbers and him not doing anything in the playoffs again. Napoli is a power guy who had a huge 2011 but fell back down to earth in 2012 but still hit 24 homers. Napoli can also play first base and can DH for the Yanks. The Yanks have to move on from Martin and get someone new. Napoli’s versatility will be key. Other teams I expect to be interested: Boston Redsox, Tampa Bay Rays, Texas Rangers, Seattle Mariners. 15.Shane Victorino: Atlanta Braves, 1 year, $6 million – The Braves could use some depth in their outfield and need a replacement in centerfield for the departing Michael Bourn. Victorino would add more grit, toughness, and leadership to this team. On the field he’s a speedster, with solid D, can fly around the bases, and smack the occasional home run. He’s obviously a way cheaper alternative to Michael Bourn and B.J. Upton, in case you don’t want to spend huge bucks on them. He’s also gonna come way cheaper the Angel Pagan, who just had a career year and will make bank this winter. I think this would be a good signing for the Braves and Victorino would replace the leadership lost in the clubhouse by the retiring Chipper Jones, but no one can fully replace Chippers’ leadership. Other teams I expect to be interested: New York Mets, Washington Nationals, Cincinnati Reds, San Francisco Giants, Boston Redsox, New York Yankees, Baltimore Orioles, Tampa Bay Rays, Cleveland Indians. 16.Melky Cabrera: Detroit Tigers, 1 year, $5 million – Melky Cabrera was facing a five-year, $75 million deal this past season after having an incredible first half. Those dreams were wiped away when Melky Cabrera came up positive for performance enhancing drugs and was suspended 50 games. Now Melky must settle for a one year, low dollar, prove yourself deal. A bevy of teams will be interested for cheap and to hopefully get good production out of him for a year. He can play all outfield spots and offers a little speed and can hit a home run here and there. I think the fact that the Tigers have both corner outfield spots open and are a World Series contender, that they will chase Melky and Melky will love the opportunity. Other teams I expect to be interested: New York Mets, Philadelphia Phillies, Cincinnati Reds, Chicago Cubs, Pittsburgh Pirates, San Diego Padres, Boston Redsox, New York Yankees, Tampa Bay Rays, Baltimore Orioles, Cleveland Indians, Texas Rangers, Seattle Mariners, Houston Astros. 17.Cody Ross: Boston Redsox, 3 years, $26 million – The Redsox and Cody Ross like each other and Ross has become a power bat at Fenway Park. Ross fits in well in the Redsox lineup and he is a scary hitter at Fenway. Ross wants a solid payday and should command a 2-3 year deal on the open market for over $20 million. I’m sure a lot of teams will jump for his services, but I think it all depends on the money and how close to a title a team is. The Redsox aren’t very close at all but they do know Ross by now and he had a great year in 2012 and the Sox will show him the money to keep him in left field. Other teams I expect to be interested: New York Mets, Philadelphia Phillies, Atlanta Braves, Cincinnati Reds, Pittsburgh Pirates, New York Yankees, Baltimore Orioles, Toronto Blue Jays, Tampa Bay Rays, Cleveland Indians, Detroit Tigers, Texas Rangers. 18.Ryan Dempster: Milwaukee Brewers, 2 years, $22 million – The Brewers need rotation depth and a veteran leader and that’s where Ryan Dempster comes in. Dempster has spent plenty of time in the NL Central, with the Cubs and Reds. Last year he was traded to the Texas Rangers from the Cubs and performed dismal in Texas, but is a very good NL pitcher and always keeps his team in the game. The Brewers have too many wild pitchers and need more hard-nosed guys that will keep them in games. Dempster and Yovani Gallardo would prove a very solid 1-2 punch atop the Brewers rotation. Other teams I expect to be interested: Philadelphia Phillies, Atlanta Braves, Washington Nationals, Chicago Cubs, Los Angeles Dodgers, New York Yankees, Boston Redsox, Toronto Blue Jays, Baltimore Orioles, Minnesota Twins, Kansas City Royals. 19.Torii Hunter: Texas Rangers, 2 years, $23 million – The Rangers have had talks with Hunter’s agent and I see a nice fit here now with Hamilton gone in Texas. Both left field and center field are available for Hunter. The Rangers would have an upgrade defensively in the outfield, more veteran leadership, and someone who is very hungry for a championship. Hunter adds a lot of pop and can help the young hitters in Mike Olt and Jurickson Profar on the Rangers. Can Hunter replace Hamilton’s production? No way, but he can still add 20+ homers and bat .280+. Other teams I expect to be interested: New York Yankees, Boston Redsox, Tampa Bay Rays, Detroit Tigers, Chicago Whitesox, Los Angeles Angels, Seattle Mariners, Atlanta Braves, Los Angeles Dodgers, San Francisco Giants. 20.Marco Scutaro: San Francisco Giants, 3 years, $31 million – One of the Giants’ 2012 World Series heroes, Scutaro was a huge help in the Giants winning their second World Series in three years. He plays tough, grinds out at bats, plays good defense, and adds some pop to the lineup and is a real table setter. The Giants want him back badly because without him they have huge trouble at second base, plus Scutaro wants to come back and is already 37 and is looking for his final decent payday. Scutaro was acquired by trade from the Colorado Rockies and was the Giants’ best hitter alongside Buster Posey in the second half of the season. The Giants gotta bring this guy back, he’s a class act. Other teams I expect to be interested: Philadelphia Phillies, Los Angeles Dodgers, New York Yankees, Boston Redsox, Tampa Bay Rays, Toronto Blue Jays, Baltimore Orioles, Chicago Whitesox. This entry was posted on November 13, 2012 by stevep. It was filed under Uncategorized .